1. Preheat the oven to 180°C, gas mark 4. Grease a 27 x 23cm baking tin and line with baking paper. a time, followed by the vanilla extract. Mix together the flour, spice and baking powder, and fold into the cake mixture. 3. Fold in the grated squash and spoon the mixture into the prepared tin. Bake for 35-40 minutes, or until a skewer, when inserted into the cake, comes out clean. Allow to cool. 4. To make the topping, whisk the soft cheese and icing sugar together until pale and thickened. Spread over the tray bake. Then cut the cake into 12 squares. Take a small piece of marzipan, about the size of a marble, and colour it green. Colour the remaining marzipan orange. Divide the orange marzipan into 12 pumpkin-shaped balls and make a small indent in the top of each. Roll out 12 stalks from the green marzipan and insert them into the indents. 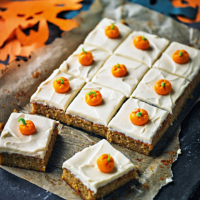 Place a completed pumpkin in the centre of each tray bake square.